uuid : a520b442-4424-42d2-a679-3d385e24b513 templates_id: 119531 templates_uuid: "7bd112b8-3f14-47f2-b96e-85ad077479d8" title: "Sale of Goods Agreement - B2B Sale of Goods Contract - Sell Your Goods" display_name: "Sale of goods agreement" meta_keywords: "Sale of goods | Sale of goods contract | Selling goods" description: "
Ensure that your sale of goods and services are recorded in a formal, legally binding contract. This sale of goods contract will help protect both parties by keeping a record of the details included in the sale. It covers the sale of goods which are owned by the seller, the description of what is to be bought, and the price, including delivery and return fees. All the relevant information required when a transfer of goods and services are being exchanged are stated here, covering the warranty and limitation of liability. This sale of goods agreement is governed by the law of England and Wales.
" created_timestamp: "2018-10-08 04:36:42.0" modified_timestamp: "2018-10-08 04:36:42.0" active: true created_by: 102 modified_by: 102 dcm_id: 347 url_slug: "Sale-of-goods-agreement" meta_description: "Use our sale of goods agreement for the sale of goods with services between a seller and buyer. This contract covers a full description of the goods. " More than just a Sale of goods agreement template, our step-by-step interview and guidance makes it easy to create your document. Easily create online, download, print and sign your free Sale of goods agreement in minutes. 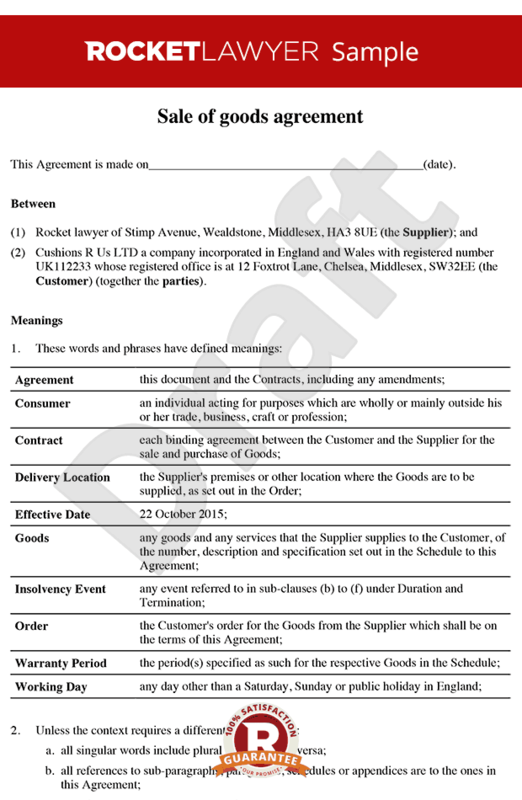 This document is also sometimes called: Sale of goods | Sale of goods contract | Selling goods.